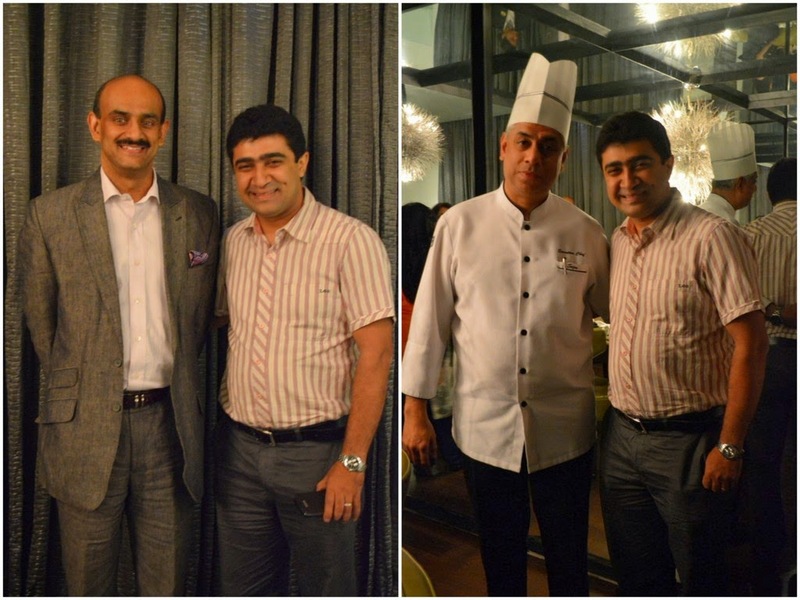 As a part of the Kolkata Food Bloggers we had the opportunity not only to be invited by the Taj Bengal, Kolkata, to their flagship Restaurant, Souk, to sample their range of Mediterranean spreads but also the fortuity to dine with the General Manager, Mr. K. Mohanchandran and the Executive Chef Sujan Mukherjee of Taj Bengal alongside exclusively. After a brief exchange of introductory salutation it didn't take long to bridge the culinary affinity that was crescendo-ed by the ceaseless draw of Mediterranean delicacies intricately prepared by the Executive Chef. The Souk experience did enhance the understanding of the authentic flavours from regions around Turkey, Greece, Lebanon, Egypt, Syria serving as a one stop place to indulge in a range of authentic Mediterranean dishes. A souk is a traditional middle eastern market place and the Souk of Taj Bengal definitely represents those culinary traditions. The Mezze consisted of a Hummus Turki, Hummus Bil Lahm, Felafil, Lahm Kibbe and Swada Dijaj and Tabbouleh served with assorted Pita. I was exposed to the authentic middle eastern flavours for the first time and I must admit it was a thrilling experience. As a food blogger I love to write about food because of my passion for it and I am sure that it is a singular subject that draws the whole humanity together, from its very need for survival and existence to the relishing adventures that takes you places and experiment new cuisine. As boundless as this subject is I have realized that there are a lot of cuisines and dishes I don't have much knowledge about and there is always the 'first time'. However, being a cook (not a chef as many people lovingly call me) there are some cuisines and dishes about which I can speak a little more in terms of intricacies, techniques and flavours. The real enjoyment comes from acknowledging the fact that knowing everything is not possible and it is not possible to know everything. Therefore I have learnt to discover food as and when opportunities arise and dining at the Souk was one such contrasting experience as I can believe that the enormous culinary expertise in Executive Chef Sujan, and the General Manager himself, backed by years of experience and exposure in the industry and first hand travels world wide was met with the like of myself having very little idea about the Mediterranean food tradition. However, that afternoon at the Taj, it was the common passion for food that translated the extreme spectrum of expert and novice into a series of platter that uttered an elevated culinary sedation. Hummus Turki and Hummus Lahm was very interesting. It was based on chickpea puree with Tahina. The Turki had chopped piri piri olives and the Bil Lahm had crisp fried morsels of lamb. The interesting part was that for a person like me having the dish for the first time in life (and thankfully not having the need to travel to Turkey just for Hummus) I thought it to be more on a cookie texture with my first glance at it. In contrast to my perception the Hummus was exceptionally soft, like a puree, that just melted in the mouth. I recollect the chef explaining the Hummus first as the platter came in but my eyes was stilled on the Lahm Kibbe (I learnt the name later). Lahm Kibbe was again an exceptional dish with cracked wheat with lamb stuffed with meat and pine nuts. It is believed that grilling originated from the Mediterranean region. With that note it was such a treat to be sampling the range of the Mediterranean grills. I love to grill myself over the charcoal fire and I realized the spices used were so very different. 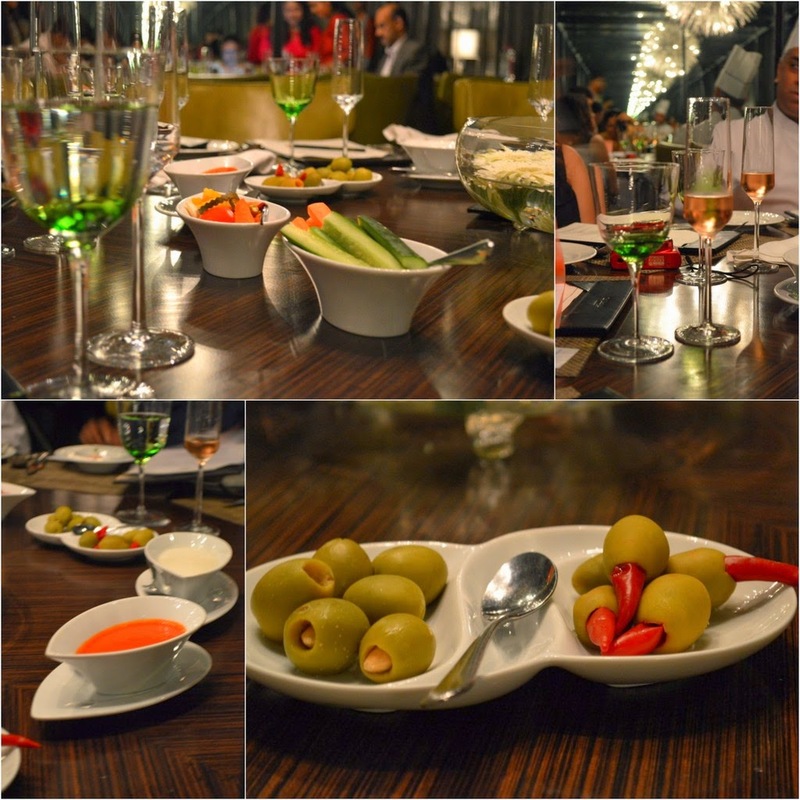 Samak Meshwi was my pick of the evening having mesmerizing flavours. The prawn was another master dish which left me spellbound. It was soft, perfectly cooked and had amazing flavours. For the main course we were served Lahm tagine. Lahm tangine was the softest lamb that I had ever laid my hands on. The pickled lime in the dish gave a beautiful tangy touch to the dish. The grain made along with the lamb was something I had for the first time and it gave a very complimenting filler addition to the lamb. Pan fried fish with pickled lemon, cayenne pepper, parsley and onion had a beautiful tangy touch to it. The trufle rice was really exceptional. The rice was flavoured in trufle oil and berries and complimented the rest of the spread exceptionally well. Again a first time dish, Moussaka consisted of layered Aubergine, zucchini, yellow squash with buttered burghul. This is a traditional Greek specialty. The Dessert Platter was unique in its own way. The rose petal ice cream was made with real rose petals and was served on a cookie. The Omali was a dessert very new to our palate which was basically baked fillo with condensed milk. After the expanse of the never ending Mediterranean platters we were served with the Moroccan mint tea which was extremely light and appetizing in nature. A perfect way to end a fabulous afternoon which would always be special in many ways. The Mediterranean Cuisine has certainly open up a whole new foodie world for us and there is no better place in the city than the Souk at Taj Bengal.